Passive fiber mode locked lasers represent the potential solution for the increasing demand of hundreds of GHz sources. These lasers are composed of a band limited amplifier, a dispersive element and a nonlinear element. When a high finesse resonant filter is added “intracavity”, they emits soliton pulses with a repetition rate equal to the filter free spectral range, a configuration known as dissipative four wave mixing (DFWM) [1,2]. The cavity modes selected by the filter exchange energy via FWM and lock their mutual phase as a traveling soliton arises. While appealing for its high repetition rates, this design usually exhibits supermode instabilities , hence it is marginally suitable for practical applications. We recently demonstrated that it is possible to obtain mode-locked soliton emission, by moving the nonlinear element inside the high-finesse filter . 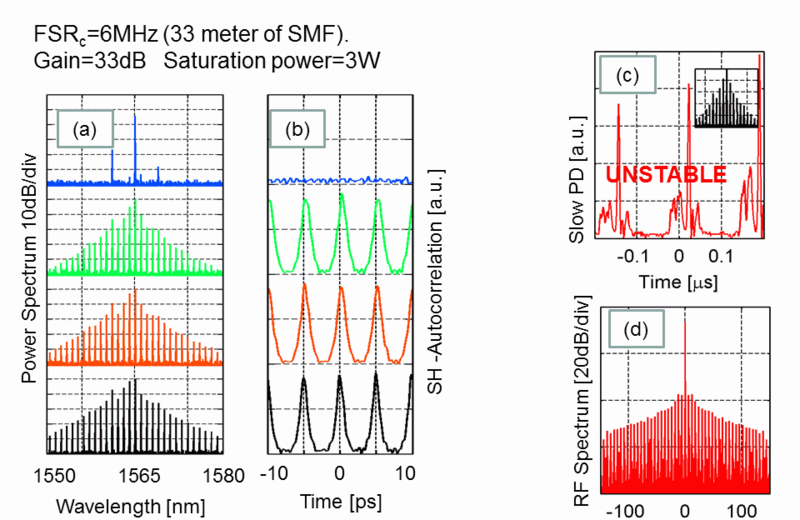 In  we demonstrated stable pulsed emission using a novel design we term Filter-Driven Four Wave Mixing (FD-FWM), which extends the DFWM concept through the use of a highly nonlinear integrated micro-ring resonator (Fig 1). Fig 1. (a) Sketch of the setup. (b) Main cavity modes position with respect to the ring resonances: when the free-spectral range of the main cavity FSRc is a significant fraction of the resonator bandwidth a single mode oscillates per resonator resonance. Remarkably, it acts as an internal nonlinear cavity, i.e. in this design the filter plays the role of both the nonlinear element and the filter, leading to stable emission: as it eliminates the need for long external cavities. This type of laser is capable of generating pulses having repetition rates beyond 200 GHz  with radio frequency (RF) noise bandwidths lower than 1 Hz. 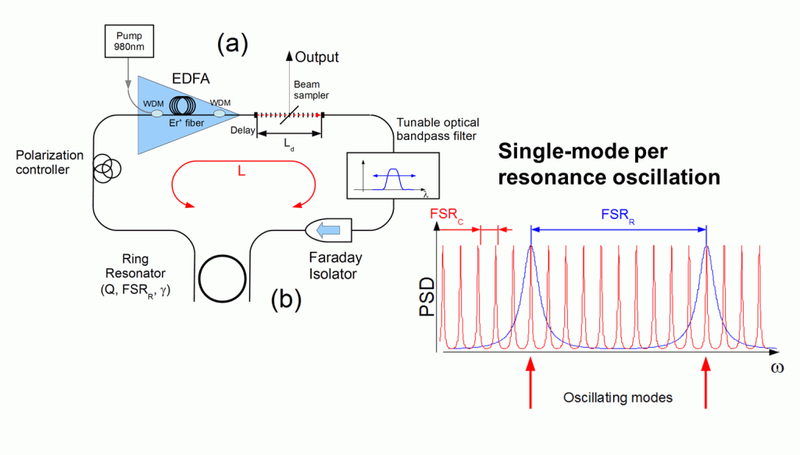 Stable oscillating regimes with two main cavity modes per ring resonator resonance has also been demonstrated . Fig 2. 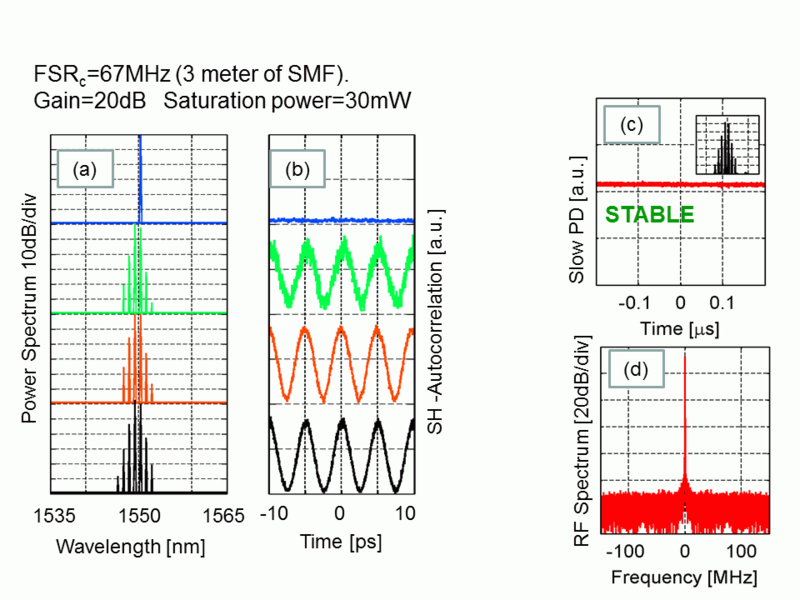 Typical operating regime of a stable FD-FWM laser. (a) Output Spectrum and (b) autocorrelation. (c) Output radio frequency signal collected using a fast photodiode and (d) its spectrum. The average input power in the ring is around 12mW whereas the amplifier saturation power is estimated in 30mW. Fig 3. Typical operating regime of an unstable (long cavity) configuration . (a) Output Spectrum and (b) autocorrelation. (c) Output radio frequency signal collected using a fast photodiode and (d) its spectrum. The average input power in the ring is around 60mW whereas the amplifier saturation power is estimated in 3W. Note that the stronger nonlinear effect (wider spectrum and smaller pulse duration) is mostly related to the strong temporal instabilities in the output power, responsible of high-peak power spikes (c). An interesting variation of the oscillation regime occurs when the main cavity filter is narrow enough to include a single ring resonator resonance. A common issue that affects all the microresonator-based OPOs realized so far is the locking between the external pump wavelength and the resonances of the cavity. Due to the small mode volume of the microcavities, the inherent power absorption induces heating of the cavity and a consequent thermal drift of the optical resonances . Soft thermal locking, among other techniques, can be exploited to solve this issue: the pump wavelength is slowly tuned in order to follow the drift of the resonance till a thermal locking is finally achieved. Fig. 4. 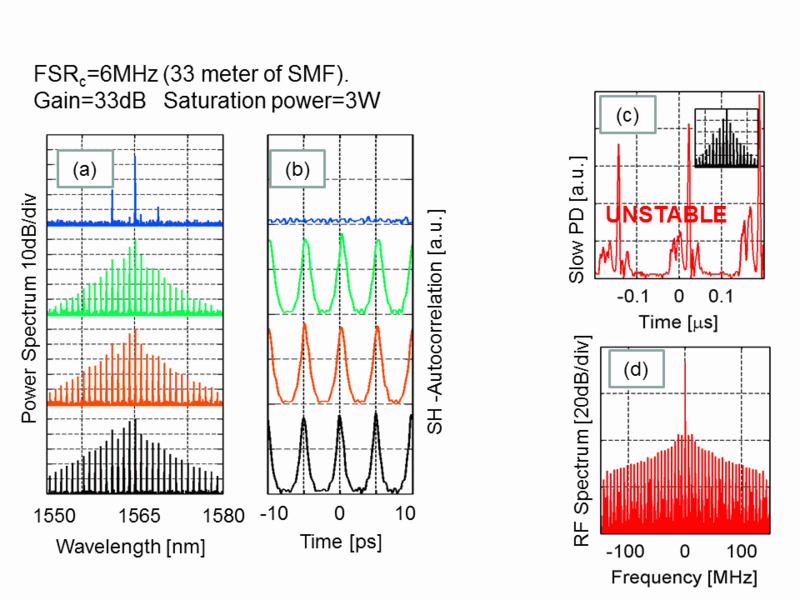 Microring output spectrum (power spectral density, PSD) recorded with the OSA. These results are obtained with a pump wavelength λp=1556nm (corresponding to a TE mode) (a) Lasing of the pump at 1mW (power in the microring). No OPO is measured. Note that our OSA has an increasing noise at wavelengths longer than 1650nm. (b) Lasing at 7mW: the OPO is detected. (c) Lasing at 10mW. A >300nm bandwidth OPO is obtained. (Note that the pump peak is off-scale). T. Sylvestre et al., Opt. Lett., 27, 482-4 (2002). E. Yoshida and M. Nakazawa, Opt. Lett., 22, 1409–1411. (1997). 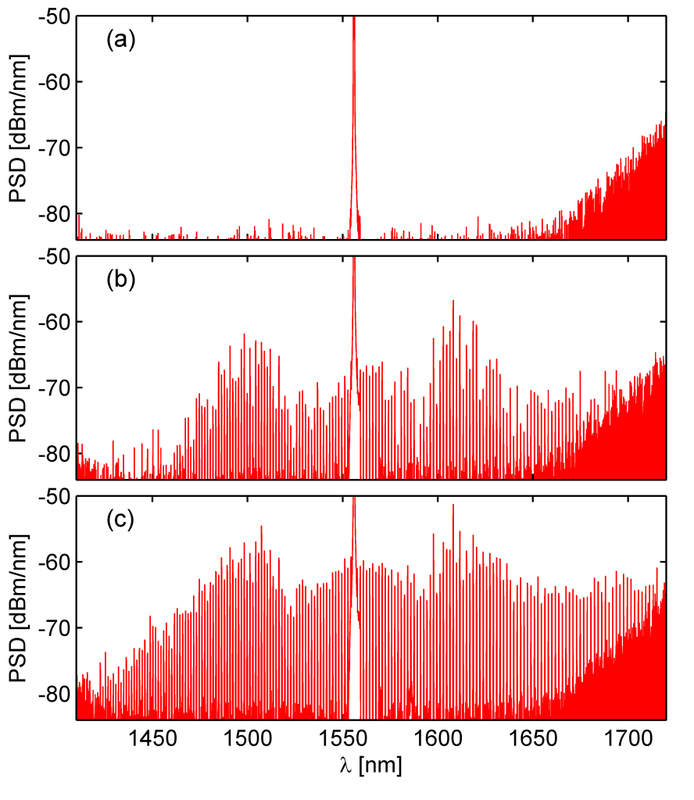 J. Schröder, D. Alasia, T. Sylvestre, and S. Coen, JOSA B, 25, 1178–1186 (2008). M. Peccianti, et al., in Conference on Lasers and Electro-Optics (2010), CPDA9. M. Peccianti, et al., Nat. Commun. 3, 765 (2012). A. Pasquazi, et al.,Opt. Express 20(24), 27355–27363 (2012). T. Carmon et al., Opt. Express 12, 4742 (2004). 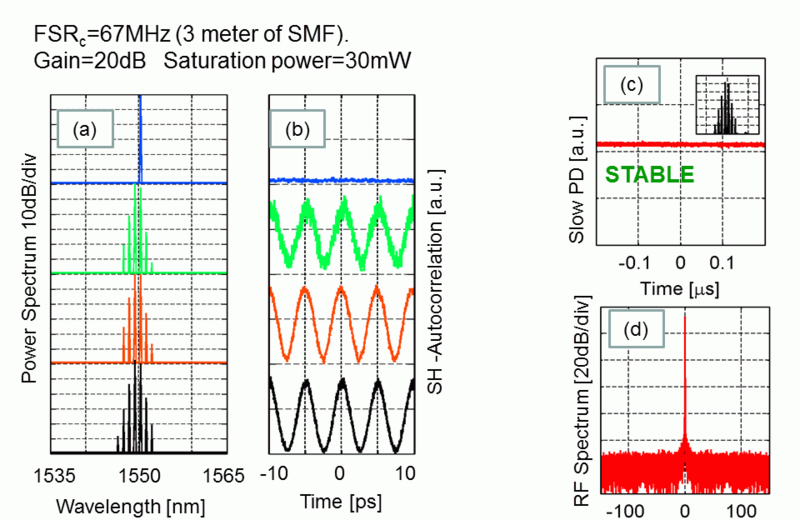 L. Caspani et al., in Conference on Lasers and Electro-Optics 2012, OSA Technical Digest (online) (Optical Society of America, 2012), paper CM2M.2.